Gen Urobuchi entered the stage wearing a gray hoodie zipped all the way up with the hood pulled all the way down so that one cannot see his face. He was escorted by two cosplayers from Fate/Zero on each side. I believe one was Saber in her suit but can’t remember for sure as photos were strictly forbidden. He sat down then proceeded to take off the hood in dramatic fashion, revealing himself wearing a Kyubey tee. I think the stunt was meant to generate a huge applause but the cheer that ensued seemed weaker than expected. 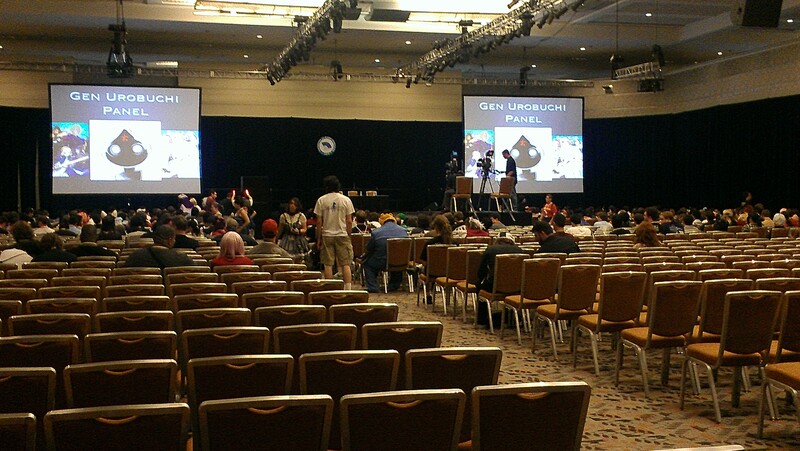 Regardless, the fan panel had a healthy turnout. They were giving out raffle tickets throughout even though I had no idea how they were distributed and did not get one. I also want to mention that I could hear Apollon playing next door which brought a smile to my face every time “Sakamichi no Melody” played. What is your impression of American anime fans? This is my second time in the US. Everyone seems really into anime and it makes me happy. 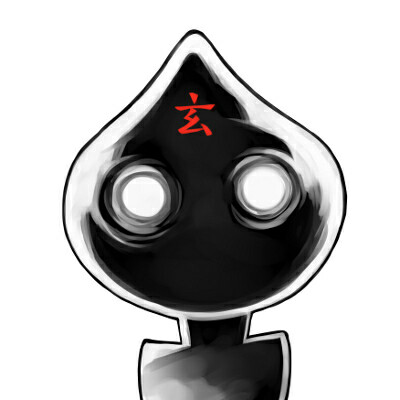 Did Gen meet Nasu and if so, what was he like? I moved next door to him. His charisma is unmatched. When I found out that witches were ex-magical girls… [the fan actually became speechless here] Did you have individual stories for each girl? Akiyuji supervised the stories including the upcoming movie. Are there plans to address discrepancies from Fate/stay night? That’s highly unlikely. Too busy. If you had a choice to become a magical girl [the audience roars in laughter], would you and what would your costume look like? [Urobuchi makes a very amused expression when the interpreter starts to translate and the audience roars again.] I am a very suspicious person. And if I ever get such an offer, I would certainly be extremely suspicious. It would have to be the devil’s work. I heard that Shinbo wanted you to change Madoka to a happy ending but you refused. Can you tell us more about that? Sayaka’s story was the main issue. In the end, the story made sense as written since what takes place is natural given the decisions made by a fourteen year old girl. What is it like to work with Studio Shaft and ufotable? They have such contrasting styles. It’s hard to tread carefully but much like the crew of the Enterprise seeking aliens, it’s exciting and rewarding to make it all work. Can you reveal anything about the movie? The movie will continue where the TV series left off. Because of the nature of the parallel universe, spin offs are very possible. What was the inspiration to harvest human emotions? Human emotion is very special. I imagine that a villain’s first choice of attack would be our most prized possession. If you were a master, who would you pick for your servant? What differences and similaries do you find between writing for games, anime and manga? Video game is the direct opposite of screenplay. People want an involved and engaging experience in a video game so it’s the equivalent of ten, even twenty, books. Whereas in anime, you want just the barebones because the director and animators have so much more to add. Which magical girl shows have influenced you? I didn’t want to reference any magical girl shows but closest would be Lyrical Nanoha and Magical Heart Kokoro. At the conclusion of the panel, Urobuchi signed three DVDs and a poster for four lucky winners of the raffle.